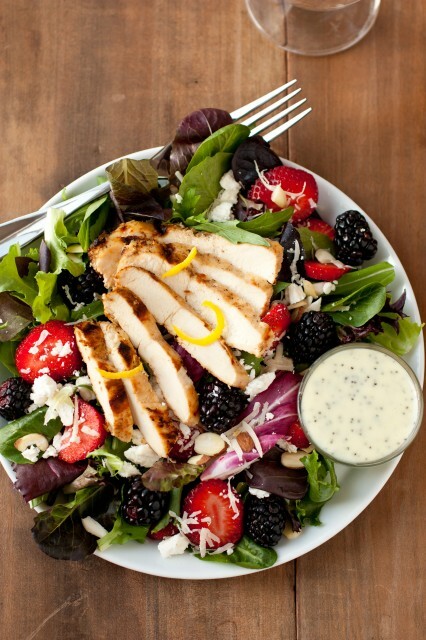 A hearty fruit filled salad topped with bright lemon chicken and finished with a sweet and creamy poppy seed dressing. Today was like Christmas for me! I opened my patio door and walked out to a temperature that was most definitely perfectly acceptable for grilling. Yes, grilling season has arrived and I couldn’t be more ready for it! I love the flavor of grilled chicken. I love the flavor of basically grilled anything for that matter. Its a flavor that can’t be imitated from baking or pan searing. I did debate with this recipe whether to do a baked crispy panko crusted lemon chicken or a grilled lemon chicken. I’m glad I went with a grilled version. 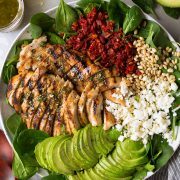 It is perfect with this salad and grilling the chicken is a savory and simple flavor enhancer. I also decided to toss in one of my latest favorites in cheese, Feta. It pairs amazingly well with the tartness of the blackberries and sweetness of the strawberries, and it enhances the slight tang of the lemon chicken. 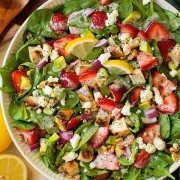 I also thought a salad this delicious wouldn’t do with a store bought dressing so I created a simple homemade version. It is unbelievably easy and if you want to shave off the step of grating the onion you could simply replace it with a 1/4 – 1/2 tsp of onion powder. Enjoy! 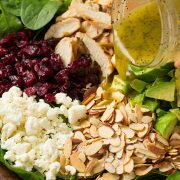 Layer salad blend onto serving plates. 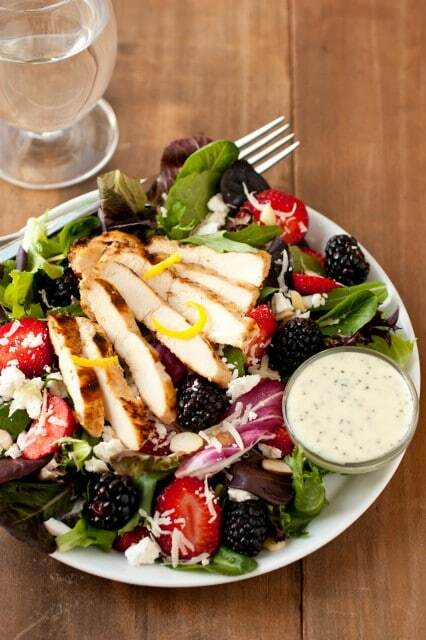 Divide strawberries, blackberries, almonds, Feta and Parmesan cheese over salad. Top with grilled lemon chicken, sprinkle with lemon zest if desired. Drizzle top with poppy seed dressing. Serve immediately. Place chicken in a large resealable bag and pound thicker portions of chicken to an even thickness using the flat side of a meat mallet. In a mixing bowl whisk together lemon juice, lemon zest, olive oil, garlic, salt and pepper. Pour mixture over chicken in resealable bag, seal bag while pressing out as much excess air as possible. Move chicken around as needed to evenly distribute marinade and allow chicken to rest at room temperature for 20 minutes. Preheat a grill to moderately high heat. Brush grill grates lightly with oil and transfer chicken to grill (if you notice lemon zest and garlic sticking to one portion of the chicken more than another just brush it along the chicken to evenly distribute). Grill 6 - 8 minutes then rotate chicken to opposite side and grill until internal temperature of chicken registers 165 degrees on an instant read thermometer (total grill time will vary based on thickness of chicken breasts, so just be sure to check the temp for doneness). Transfer to a plate, cover with foil and allow to rest for 10 minutes, then slice into strips about 1/2-inch thick. In a mixing bowl, whisk together mayonnaise, sugar, apple cider vinegar, grated onion, mustard and salt until sugar has nearly dissolved (at this point you can transfer to a blender to mince onion pieces further if desired). Stir in poppy seeds. Transfer to an airtight container and refrigerate 30 minutes. Remove from refrigerator and stir (if you would like dressing to have a thinner consistency you can mix in a little milk 1 tsp at a time to thin). Store dressing in refrigerator.